Urine contains an abundance of nitrogen and phosphorus, which can be reclaimed and pasteurized to create a safe and effective fertilizer. But most urine-diverting toilets are made in such a way that the user has to sit down. Not surprisingly, this can pose an issue for male users. In response to cultural norms about standing vs. sitting, Earle Barnhart wrote the following article, Confessions of a Recovering Urinator. He asks his fellow men to “man up” to new ways of peeing— and reviews some designs for a urine-diverting urinal. Click here to read the PDF version. 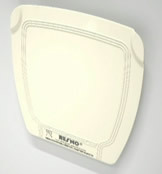 The Resno is a waterless plumbing fixture, classified as a “CONCEALED URINAL”, designed to be installed permanently into a 2 x 4-inch wall, for the purpose of disposing of male urine in a convenient and sanitary manner. Certified for plumbing codes in the US and Canada, the unit features a tip-out door, stopping at a specific angle, to provide a trough for the purpose of directing the urine into the drainage system. The one-piece trough-door easily lifts out for periodic sanitizing. It adds up to yearly savings of water and sewer charges; but most important, the conservation of millions of gallons of precious drinking water. Urine contains “salts” which adhere to walls of the trap, and clogs sewer pipes. This is eliminated by the use of a “Biological Puck” that contains a specific bacteria that dissolves the salts and removes odors. This puck is placed in a retainer, permitting the urine to pass over it, and down the drain. It lasts 1 to 2 months, depending on usage. The residential design is intended to provide a convenient and aesthetically acceptable fixture suitable for installation in rooms frequented also by females. Such rooms may include bedrooms, laundry rooms, mud-rooms, or pool buildings. This invention also accommodates age-old problems for women: finding the toilet seat up and urine splash around the toilet. Download a brochure or visit the company’s website for more information and to purchase.